Celebrating the Birthday of the Church by understanding the miraculous functioning of Christ’s Body. Exploring the graces given by the Holy Spirit. Fr. Vazken takes the congregation on a journey from the first Pentecost to today, insisting that true salvation still has One source. 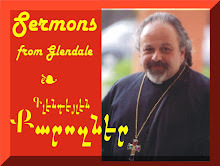 Delivered and recorded LIVE in Glendale, CA at the Armenian Church Youth Ministries’ Center; May 23, 2010. On the values that made Armenian motherhood uniquely Christian. The view from the Cross gives us a chance to find a better view – one that asks us to look in different directions. Includes an introduction of Woman of the Year, Anoush Dekmejian. Delivered by Fr. Vazken Movsesian and recorded LIVE at the Armenian Church Youth Ministries Center, Glendale, CA May 9, 2010. Produced & Engineered by Suzie Shatarevyan for epostle.net.